Danny Schmidt caught my attention with a single cut," Esmee By The River," which appeared in an issue of Sing Out! Magazine several years ago. I was struck then by the sparse, almost fragile vocal performance, and the highly literate, deep image driven lyrics. 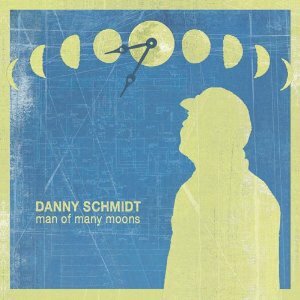 On his seventh release, Man of Many Moons, I remain struck. There is no hiding for this artist on these eleven well-crafted tracks. The arrangements are bare and revealing. It's just Danny and guitar with bass, a tiny bit of piano and harmonica, and some haunting vocal support from fellow Red House artist, Carrie Elkin and Raina Rose. The songs center around the tricky concept of commitment, and the result is another glimpse into the complicated psyche of this talented, Austin-based emerging singer-songwriter. With the exception of Bob Dylan's, "Buckets of Rain." The songs are all Danny's and, like Dylan's songs, they are mostly complicated word pictures that seem to come to life the more you listen. This is especially true of the first three tracks leading to the Dylan cover. The CD takes a lighter turn at this point including a twisted love song called "Ragtime Ragtime Blues," a daring venture, if you ask me. "Guilty By Association Blues" is the most political recorded Danny Schmidt song to date and "Almost Round the World" is the account of what happens when you sing political songs in a world connected by social media. Man of Many Moons ends with a song of simple advice about being careful of advice. "Know Thy Place" reminds us of the pitfalls of letting other people's fears block the path of wherever it is we're going. Approach these songs as you would a great painting. Spend time with them. Walk around them. Stand back and then, just when you have it figured out, step closer until they envelope you. You won't be disappointed.